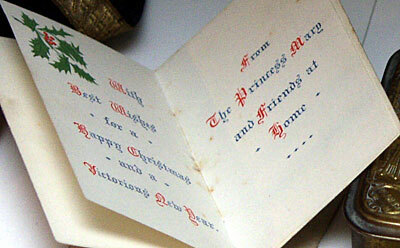 In November 1914, an appeal was launched to raise money for a ‘Sailors and Soldiers Christmas Fund’. It was the idea of the King’s 17 year old daughter, Princess Mary, and aimed to provide everyone who would be wearing the King’s uniform on Christmas Day 1914 with a gift from the nation. Smokers received a pipe, a lighter, 1oz of tobacco and 20 cigarettes: for non-smokers and boys there was a bullet pencil and a packet of sweets instead. Indian troops often got sweets and spices, and nurses were treated to chocolate. 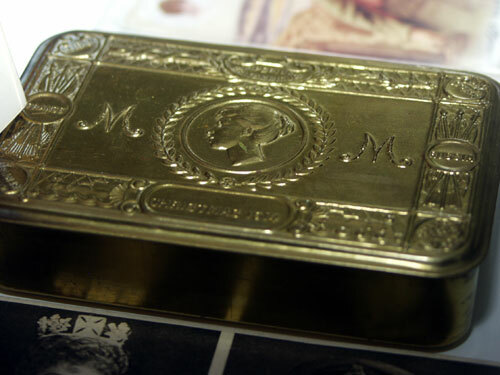 Many of these items were sent out separately from the tins themselves as, for example, once the tobacco and cigarettes were placed in the tin there was little room for much else apart from the greeting card. The wounded, whether at home or in hospital, nurses and the widows or parents of those killed were also entitled to the gift. Those who were prisoners of war had theirs reserved until they were repatriated. Every effort was made to distribute the gifts in time for Christmas 1914, and more than 355,000 were successfully delivered by that deadline. However, a shortage of brass meant that many of those entitled did not receive their box until as late as the summer of 1916, and a considerable number had still not been distributed by January 1919. By the time the fund closed in 1920, almost £200,000 had been raised, and more than two and half million boxes with contents had been issued. As the name suggests, these brooches were given by men in the forces to their sweethearts for them to wear on their lapels. 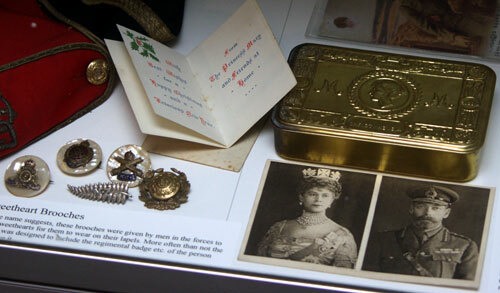 More often than not the brooch was designed to include the regimental badge etc. of the person who gave it.